7,500 Strangers Just Bought A Crumbling French Chateau Together : The Two-Way Each paid at least 50 euros to "adopt" the castle and help restore it. The campaign is part of an effort to crowdfund the protection of the country's cultural heritage sites. The ruined castle of La Mothe-Chandeniers in central western France. The crowdfunding site Dartagnans organized an effort to buy the chateau for 500,000 euros. It's late 2017. By now, crowdfunding has been used to finance films, board games, classical music, scientific research and infertility treatments. 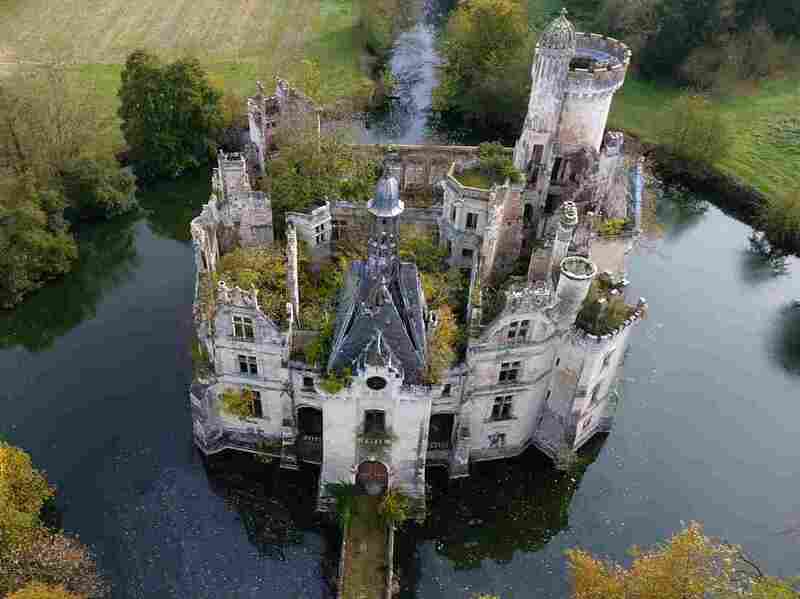 Add this to the list of things bought with collective purchasing power: A chateau in the French countryside, complete with moat. The platform used to raise the funds announced on Friday that the castle had been purchased by milliers d'internautes – that is, thousands of Internet users, who each paid at least 50 euros (about $60) to "adopt" the chateau and help restore it. In just 40 days, the site raised the 500,000 euros it needed to buy it. "It's done, it's historic!" it said. "The Château de la Mothe-Chandeniers now belongs to thousands of Internet users. Through this collective purchase, we believe in the preservation and development of the heritage of tomorrow and prove that civic strength is always the greatest." According to the campaign's organizers, the chateau dates to the 13th century, and it was looted and abandoned during the French Revolution. In 1809, a rich Parisian entrepreneur bought and restored it; later, a squire of Emperor Napoleon III undertook a massive, Romantic-style reconstruction. In March 1932, a fire broke out, destroying the roof and causing the chateau to be abandoned once more. Sweeping aerial video of the castle (with requisite dramatic music) makes it look both amazing and decrepit. Trees grow where the roof would be, and the stone walls are mottled with moss. The building is almost entirely open to the elements. The campaign organizers say they've been contacted by a number of film and television production companies about renting the castle. Sadly, a suite at the castle is not part of the deal for the thousands of donors, though a gift of at least 60 euros (about $71) gives each patron a membership card and "access to part of the castle." The real gift, the campaign explains, is that patrons can become investors in a company that will own the castle, and "collectively decide its future." Dartagnans, the platform used to raise the funds, was specifically designed for campaigns like this, which it calls "participative patronage." Its goal is to engage people in collectively financing the protection of France's patrimoine — its cultural heritage. In exchange, patrons get gifts and tax deductions. If you want to join the internauts and buy into La Mothe-Chandeniers, it's not too late to join the second tier of contributors. The site says that all new contributors can also become co-owners. But why stop there? The Dartagnans site has an array of other castles, churches, and hydraulic rams to adopt.